I spent a sunny afternoon playing tourist in Portland, Maine yesterday. I poked into Miccuci's to load up on Italian ingredients and wines, then walked the length of Commercial Street all the way to the Bam Bam Bakery (gluten-free!) This is the route you take for glimpses of Casco Bay and cruise ships unloading day trippers, a taste of chowdah or lobstah, and Maine-ish gifts ranging from blueberry jam to deep sea diving helmets. This is the Person From Away view of Portland, but as the folks who actually live there know, there's way more going on in the "port city." Stroll a few blocks off Commercial Street, and check out the halal store. Stand outside the public schools and listen to kids converse in languages you can't easily identify. Visit the Catholic cathedral and watch women and girls in body-masking hijab stroll by. Immigrants and refugees from Asia, Africa, Latin America, Eastern Europe and the Middle East have been making Portland their home during the last three decades, and influencing the culture of the city. This shift is the impetus and focus behind a year-long, city-wide "read" of books focusing on the new arrivals community. 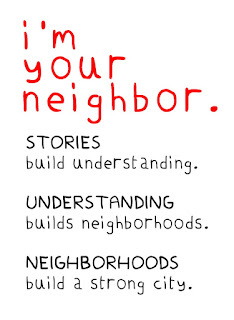 I'm Your Neighbor is primarily composed of children's books, but also includes non-fiction collections of essays as well as novels for older readers. Saturday, May 25th, marked the official kickoff to the community read, which includes Out of Nowhere. The University of Southern Maine bookstore carries the entire collection, and was on hand with plenty of books. The Portland Public Library also has multiple copies, as well as other area bookstores. Dr. Krista Aronson, Professor of Psychology at Bates College, is the I'm Your Neighbor Project Scholar and spoke to students who attended the kickoff event. Students from Casco and Deering High Schools with copies of Out of Nowhere. 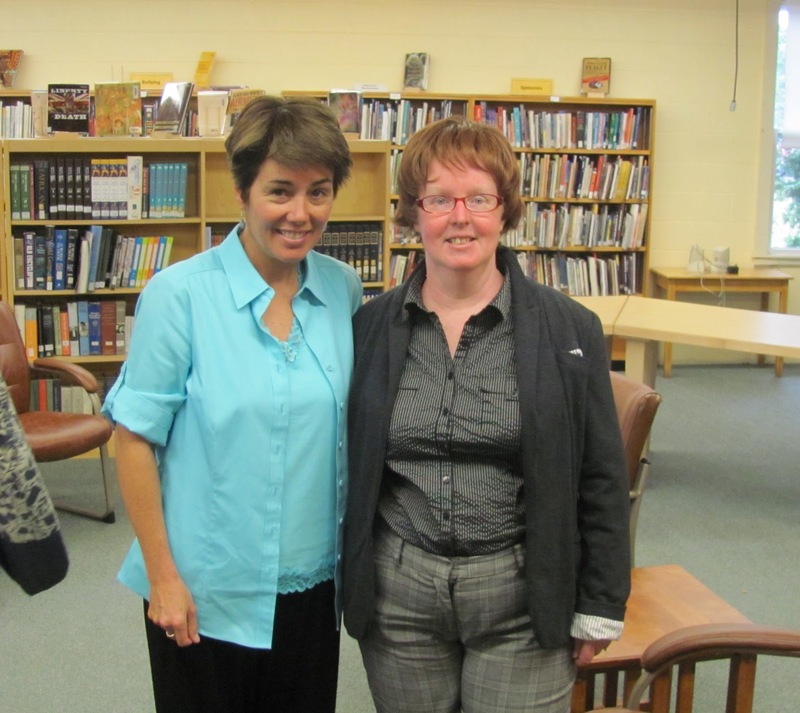 Kirsten Cappy (left) of The Curious City, along with author/illustrator Anne Sibley O'Brien is the driving force behind I'm Your Neighbor. Here's Kirsten with author Frederick Lipp, whose book, Bread Story, is part of the community read. Here I am with author Terry Farish (left) whose book The Good Braider, about a Sudanese refugee girl, is part of the community read. 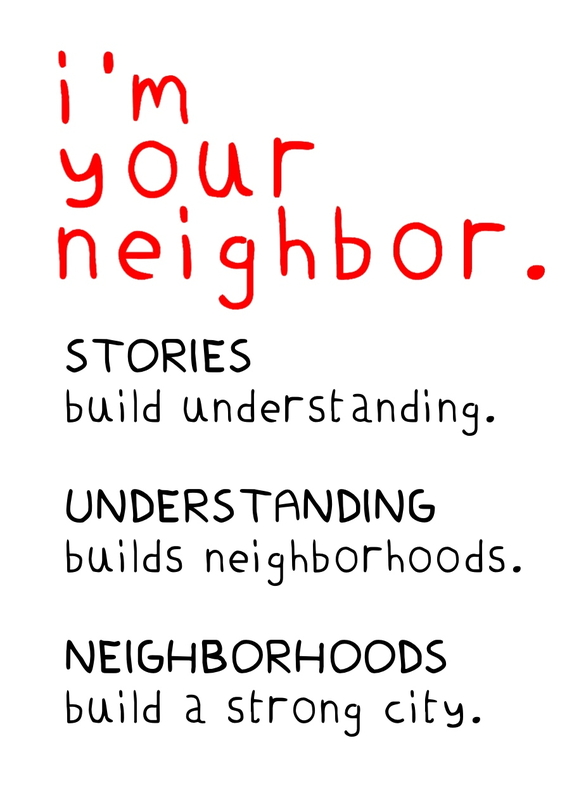 For a complete schedule of I'm Your Neighbor events, visit their website. Next up is on July 11th at Rines Auditorium at the Portland Public Library, when Terry Farish will be joined by hip hop artist O.D. Bonny and A Company of Girls. On an ordinary day I'm usually alone for hours with imaginary people, tapping away at the computer. This is fine, but it definitely gets a little lonely, and sometimes you wonder: is anyone out there actually reading these stories? Then, there are the Not Ordinary Days, when I visit schools and libraries and meet breathing-talking-laughing readers, and it's AMAZING. It started off at Devaney, Doak and Garrett Booksellers in Farmington, Maine. This is where I found the wonderful Kenny Brechner, who put this day together. Kenny had read my new book, Out of Nowhere, and thought it would be a good fit for high school readers. Kenny's also pretty savvy about the realities of school library budgets, and is keenly aware that rural schools can't afford to purchase scores of hardcover books for readers or fork out big fees to visiting authors. So, he found a sponsor, Franklin Savings Bank, to pay for the books, and when I agreed to donate my time, we were off. Kenny was my fearless driver for the day, and took me everywhere I needed to be, on time! We began at Mt. Blue High School in Farmington, where they put together a whole day of activities surrounding diversity and immigration issues. Mt. Blue is currently under construction, so it was a bit dicey finding the entrance, but once we made our way in we were amazed at the beautiful space created for the students. The cafeteria, usually not a high point for any public school, is more like an airy college student center, with lofty ceilings and bright, natural light pouring in. We were led to this room I can only describe as an amphitheater. It was filled with kids who had read, or were reading, Out of Nowhere, and I had a full hour with them, reading from the book and answering questions. In the audience were four young women, now in college, who had graduated from Lewiston High School (Lewiston was the inspiration for much that transpires in Out of Nowhere) two years ago, and it was a real privilege to hear from them and get their insights into their community. and Sydnie Racine, all LHS grads. Following my book talk, there was a panel discussion that included the Lewiston High grads, a rep from the Maine Civil Liberties Union, a rep from Maine Civil Rights Workshops, and folks from Hope Acts, a group in Portland providing support to newly arrived immigrants and refugees. Several of the panelists were asylum seekers from Burundi who have recently come to Maine. I think for most of the students, it was the first time they'd met anyone who have had the type of life experiences these men have had. There was a lot more going on after that ... including some Somali cooking demonstrations, which I was very sorry to miss ... but Kenny and I were off to our next appointment at Mt. Abram High School, in Strong, Maine. You can't make that up: Strong, Maine. It's really the name of a town. Love it. Mt. Abram High School, with only 254 students, encompasses a huge, rural district that borders Canada in places. Some students live so far from the school, that during the week they live with host families, and only return home to their parents on weekends. Some students travel close to 50 miles, one way, on the bus to school each morning. When Kenny and I arrived, we were greeted by librarian Lori Littlefield, who told me I was the first author who had ever visited Mt. Abram. When you visit a school where the kids have already read your book, the discussion literally vaults to a whole new level. You can really "get into it," and they can tell you what they liked and didn't like, what they thought of particular characters, and ask probing questions about choices you made as an author. Why did you tell the story from that point of view? What was the inspiration for that character? It's not very often that a school district can afford to put multiple copies of a hardcover book into the hands of every kid who wants to read it ... but every student in that room had read Out of Nowhere. They came prepared with terrific questions, and I can't say enough about how much I enjoyed them. And how deeply I appreciate all the effort that went into making those books available to those kids. I also coaxed some great info out of them. One of my favorite questions to ask kids is about slang, and see if they can teach me some new "kid speak" I haven't heard before. My favorite from yesterday was "mint." As in "mint condition." For example, you might say to a friend, "How're you doing?" And he'll reply, "I'm mint." Or just, "Mint." Which translates to: "I'm doing great. Top of the world. Couldn't be better." If you'd asked me how I was feeling as Kenny and I wrapped up our day of school visits yesterday, I'd have to say: "Mint." To say I love to read is such an understatement. Books, stories, literature, have been my way into the world. I honestly don't know who I would have become without the books in my life. Possibly something not so good, because the written word has been such an outlet for me. There's a great passage in Maria Semple's latest novel, Where'd You Go, Bernadette?" where the protagonist is advised to continue with her creative pursuits, because if she doesn't she's likely to become a menace to society. My love/passion/need for books informed my parenting. I held picture books before my newborn's still-unfocused eyes, before he had the strength to hold his own head upright. It was a big, big moment in our home when we were reading Chicka Chicka Boom Boom to him for the millionth time and asked him to point to the picture of the moon and he actually raised his chubby infant finger and planted it on the round, gold orb on the page. (His sister insists this was merely a coincidence and we have been over-praising his minor achievements for far too long, but that's a blog post for another day ... ) The best moments of my life have been spent with my childrens' warm bodies tucked in close to me while we read together. So the notion of a child without a book pains me, literally. 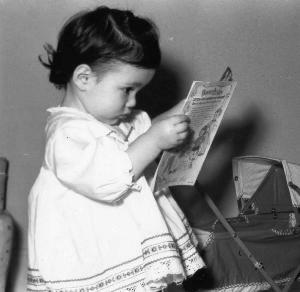 The idea that a child might never know the joy of owning his or her personal book is so sad. The excitement I see on childrens' faces when they hold their own books is deeply moving. Middle-grade author, Donna Gephart (her most recent book is Olivia Bean, Trivia Queen) recently participated in the "Kids in Need - Books in Deed" program, which purchases books for children and brings writers into their schools. 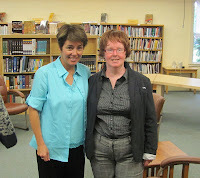 What a gift: not only to have one of Donna's laugh-out-loud books in hand, but to actually meet her! Another middle-grade author, Lynda Mullaly Hunt (author of One for the Murphys) identified, while she was researching her novel, that foster kids often never own their own books. She's created a website which brings new books and social workers together, so that the social workers can choose books for their clients and give them out ... free to the kids. It's called the Book Train, and is just "leaving the station," so to speak. In future posts here, I'll share with you the books I'm donating to Book Train. This week, I'm mailing off a new copy of the Newbery winner, The One and Only Ivan, by Katherine Applegate. In case you haven't read it yet, it's a beautiful story.